A pontifical has instructions for the performance of all the sacraments conducted by a bishop. These episcopal services are often complex with prayers, hymns and processions. This pontifical belonged to the medieval cathedral of St Mungo, in Glasgow. It has early musical notation for hymns. Following the ceremony for the election of a bishop, this page has the blessing of the bishop. The rubric (inscription in red at the top of the page) gives the title, while the prayers are written in black. The grand, large letters express the status of the bishop. 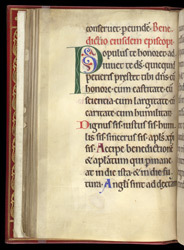 The dignified, clear handwriting presents an example of 12th-century style.